Working with partners in Afghanistan, Guatemala, Ghana, and India, PWS&D is responding to situations where women, youth and marginalized people are too frequently treated as second-class citizens, lacking access to basic human rights and freedoms. Through programs with local partners, women, children, and indigenous peoples are learning about their rights and working together to protect and defend themselves. In addition, PWS&D partners work with state and government agencies to encourage the implementation of national and international treaties the country has signed. In addition, PWS&D’s support to KAIROS: Canadian Ecumenical Justice Initiatives and the Maquila Solidarity Network helps protect the rights of workers, women and children around the world. PWS&D advocates for the rights of people with disabilities and helps people realize a disability is not an inability. In 2013, with PWS&D support, KAIROS: Canadian Ecumenical Justice Initiatives worked with women and men in the Democratic Republic of Congo, Palestine and Israel, Sudan, South Sudan, the Philippines and Colombia to foster economic empowerment and support healing processes. Education and awareness, skills training, capacity building and mobilization are some of the ways that local partners are making a difference in their communities. The Maquila Solidarity Network, a Canadian based labour and women’s rights advocacy organization, works to improve working conditions and wages for those employed in maquiladoras (textile factories) and global garment supply chains. By engaging in north-south dialogue with grassroots labour organizations in Mexico, Central America and Asia civil society capacity is being strengthened. PWS&D partners work with families, teachers, the police, lawyers, government and businesses to find creative solutions to the problems that are forcing youth onto the streets and to stand up for the rights of children. 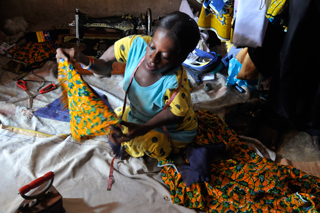 Education and alternative programs are offered to help eradicate child labour and commercial sexual exploitation. People living with disabilities are finding acceptance and opportunities for the future through support groups, community education and vocational training. Women are forming self-help groups to support one another as they defend their human rights in their home and wider community – some of whom have since gone on to run for municipal government offices or have formed official women’s associations. Through your generous support, people are learning about their human rights and working together to create positive changes in their lives. Make a donation today!